Hello there and thank you for stopping by today. Today is the second day of the MFT Release Countdown. Only 4 days until the new release (yay)! Be sure to head over to the MFT Blog for full set and die reveals for the day. This release is packed full of gorgeous new products. My card today features the new Happy Hedgehogs stamp set and Die-namics. 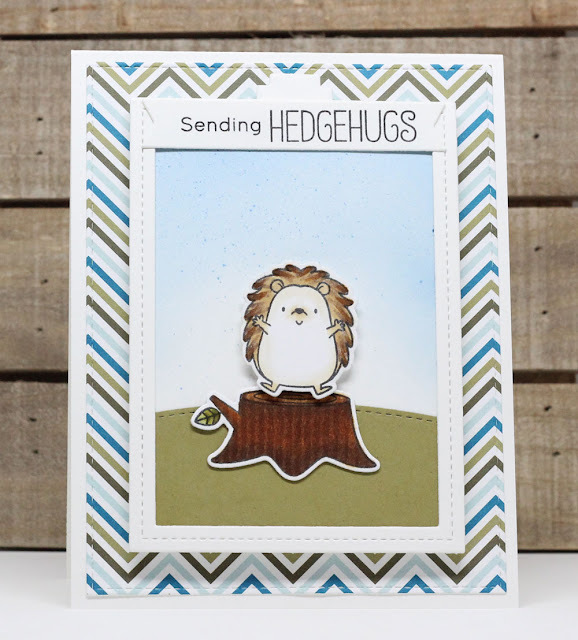 It is a set FULL of adorable characters and super cute scene-building elements, as well as SUPER cute sentiments. 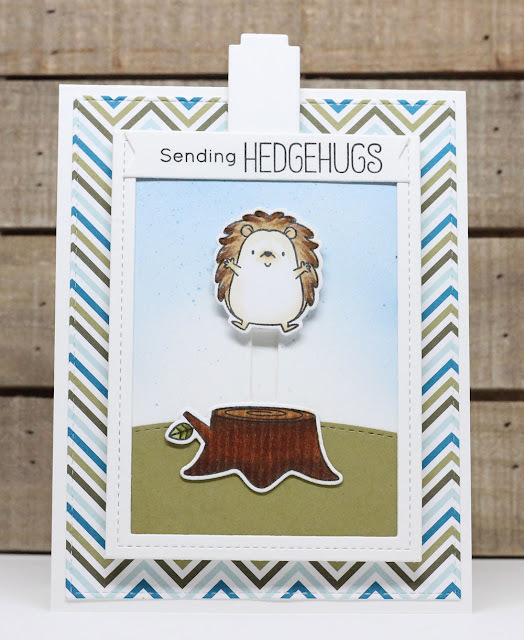 I opted to create a simple scene using one hedgehog and the tree stump. I used the mechanism from the Interactive Birthday Cake to make him jump up off the stump using the pull tab. The background was airbrushed with Copic markers. I used the Copic blender refill and a hoodie wristband to create the bark texture on the stump. The scene is framed with the new Single Line Stitch Rectangle Frames. I included a piece of patterned paper directly on the card base to pull together all the colors and add a little pizzaz. These products and many more will be available for purchase in just 4 days, on September 6 at 10 PM EST. Be sure to check out the MFT Blog to see what the rest of the team has come up with today. Oh I LOVE how he is jumping!! This is so CUTE!!! Cute card! I love the colors and background paper you chose! The moving elements make it even cuter! What a happy , pleasant hedge hog card- great job!